Trust Northern Mini Storage for clean, safe and protected self storage for your stored belongings. Protect sensitive documents, furniture and equipment with our heated self storage units. Our units feature extra high ceilings so even your largest and bulkiest items will fit. We have a large facility, with wide aisles and drive-up units available to make your loading and unloading process as easy as possible. Our site is monitored live 24 hours a day by Video Internet Technology, providing you with peace of mind knowing your belongings are safe. We are conveniently located about 9 minutes north of Sudbury. Ready to see what we can do for you? 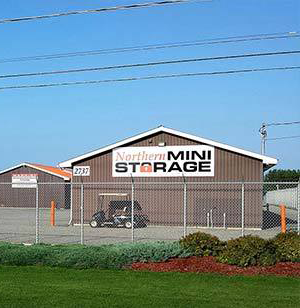 Call Northern Mini Storage today.